One day, Jim was expecting to have some new things to do for work, but he didn’t get the access expected, so instead of hanging around waiting for someone else in another state to do what he needed them to do, we went exploring. He needed a haircut, so after searching for places fairly close and open on Monday, we headed to Spearfish, a town we wanted to visit anyway. After the hair cut, he and I walked around the downtown area for a bit, and then we went to the Bay Leaf Cafe for lunch. That was a good choice. The building in which the restaurant is located is the only remaining original false-front building in the town. The folks who own it bought it several years ago and completely renovated it. Originally a hotel, instead of 12 sleeping rooms, it now has 3 apartments above the restaurant that is on the street level. The food is mostly sourced locally, something I love. If in Spearfish, give it a try. He and I wrapped up our time in the town by shopping in a natural food and products store, scoring some great smelling goat’s milk soap. Next, we decide to visit Deadwood, so down into the town we drove. As we were nearing the town, we came around a slight curve in time to see two mountain goats clambering up an almost vertical rock wall. It was mesmerizing and happened too quickly to get a photo. We parked and fed the parking meter (come prepared with change – parking is at a premium in Deadwood, and one pays for it). Walking down the side walk, it was not long before we spied a sign indicating the location in which “Wild Bill” Hickok was shot in 1876. Jim was excited; this was the main thing he wanted to see. 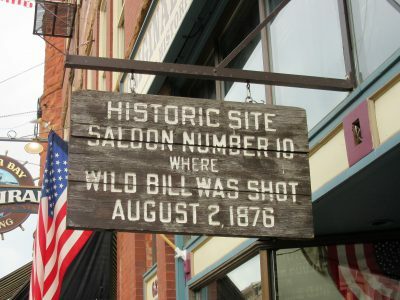 Sign marks the place of Hickok’s death. Learning that the next tour would be in 30 minutes, Jim bought his ticket and we did a little exploring separately. When he went downstairs to see the original bar, I began to think about how this could be true as I sipped my Huckleberry Lemonade and waited for his return. (I did not think it worth another $10 for me to go on a 15 -20 minute tour, also.) If truly the original bar where Hickok was shot was below now and was street level then, what seemed logical to me was that when water, gas, and sewer lines and the such was added to the town, not having much option for going further down, the main street must have been built up to allow for these things. If so, then what had been street level would now be the basement, and the second story of those buildings would be street level now. Based on what Jim told me upon his return, I think my assumptions are pretty close to the truth. 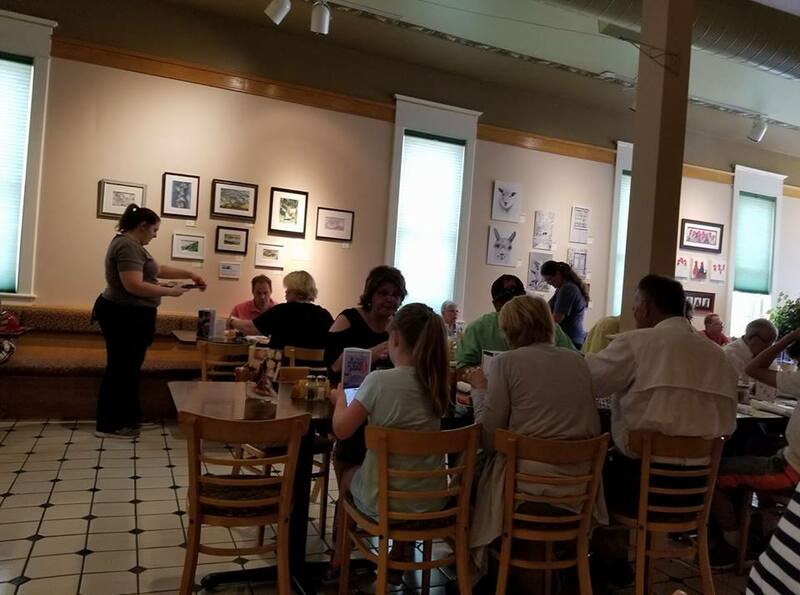 Below are pictures Jim made during his tour. We stayed in town for a bit to see the 4:00 p.m. “historically accurate” gun fight. It was brief but kind of interesting, though I’m not sure it was worth the wait. Here’s a few photos we made of things in town, several of which have historical importance, some of which I mention below. Utter was here in the beginning of the town. The Bullock Hotel, which still operates in the town today, was built by Seth Bullock. Bullock, previously of Montana, was a business man and also the sheriff in town. When Theodore Roosevelt, whom Bullock knew, became president, he appointed Bullock as U.S. marshal in South Dakota. Rumor has it that Bullock haunts his hotel to this day. Charlie Utter was a friend of Hickok and even paid for Wild Bill’s burial. The Gem Theatre, which was really a saloon and brothel in the early days of Deadwood, was owned and operated by a businessman named. Al Swearengen. Jim and I wrapped up our day of exploration by driving through Sturgis. Each year, around the first part of August, bikers congregate in the area, centered at Sturgis, for Bike Week. In 2015, it was estimated that 700,000 bikers came here. We want to be long gone before August, but Jim still wanted to drive through the down. Bike week began in 1940, so that makes this year’s event the 77th Annual Bike Week. Jim and I had an interesting day, and I’m so glad that Jim got his wish to see where Wild Bill was actually shot.